I just put the last stitch in when I got home from work tonight, so they aren’t done a day too soon. These are socks for Jennifer for when she goes into the hospital. I hope she enjoys wearing them as much as I enjoyed making them. 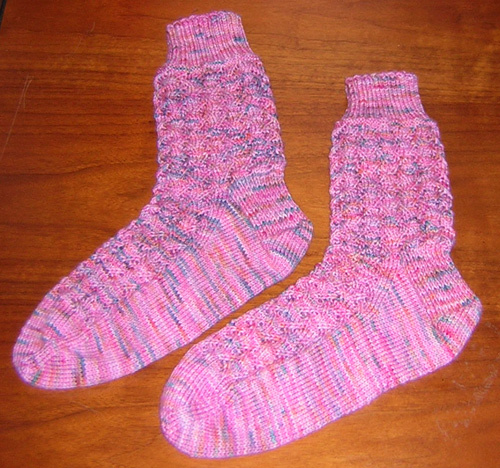 The pattern is Nancy’s Lindberg’s basic knit-to-fit sock pattern, but I used a crosshatch lace pattern from Charlene Schurch’s More Sensational Knitted Socks for the calf and top of the instep. Knitting & Crochet, Pictures. permalink. Boyd, those socks are so pretty and soft, too. Jennifer will really appreciate having those socks when she is in the hospital. They are a sweet gift for her. You’re very thoughtful. They are really beautiful, Boyd, and I know they are sacred socks made with intention and love. I just finally saw Siri’s room and the colors, and that pram is absolutely wonderful. Thinking of you several times daily. Beautiful socks Boyd! You are such a sweet guy!